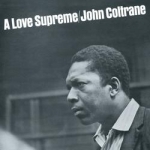 John Coltrane saw his album-length suite A Love Supreme as his gift to God. The world has come to see it as a classic -- not only Coltrane's best known work, but one of the most influential jazz records ever made. This edition, newly remastered from a recently discovered first generation master tape by original recording engineer Rudy Van Gelder, presents the suite as you've never heard it before.